Institutions now dominate trading in equities around the world. Mutual funds are the most prominent, and doubly important as custodians of retirement savings. Despite this, there is no comprehensive description of fund manager behaviour, much less a matching theory. This is troubling because one of the most economically significant puzzles in finance is why experienced, well-resourced fund managers cannot outperform the market. Applied Investment Theory: How Equity Markets Behave, and Why brings together academic research, empirical evidence and real market experience to provide new insights into equity markets and their behaviours. The book draws upon the author's rich industry experience and academic research, plus over 40 interviews with fund managers on three continents and across different markets. The result is an innovative model that explains the puzzle of poor performance by mutual funds in terms of structural features of markets, the managed investment industry, and the conduct of fund managers. This book provides a fully integrated depiction of what markets and investors do, and why - insights that will resonate with the needs of investors, wealth managers and industry regulators. It is fully documented, but free of jargon and arcane math, and provides a grounded theory that is relevant to anyone who wants to pierce the opacity of mutual fund operations. 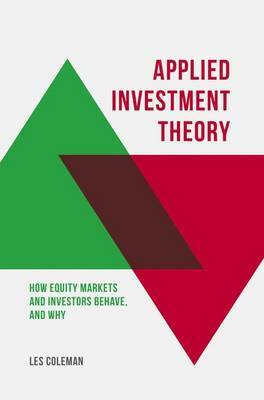 Applied Investment Theory sets out a new paradigm in investment that is at the forefront of what should be an industrial-scale development of new finance theory following two decades of almost back-to-back financial crises.